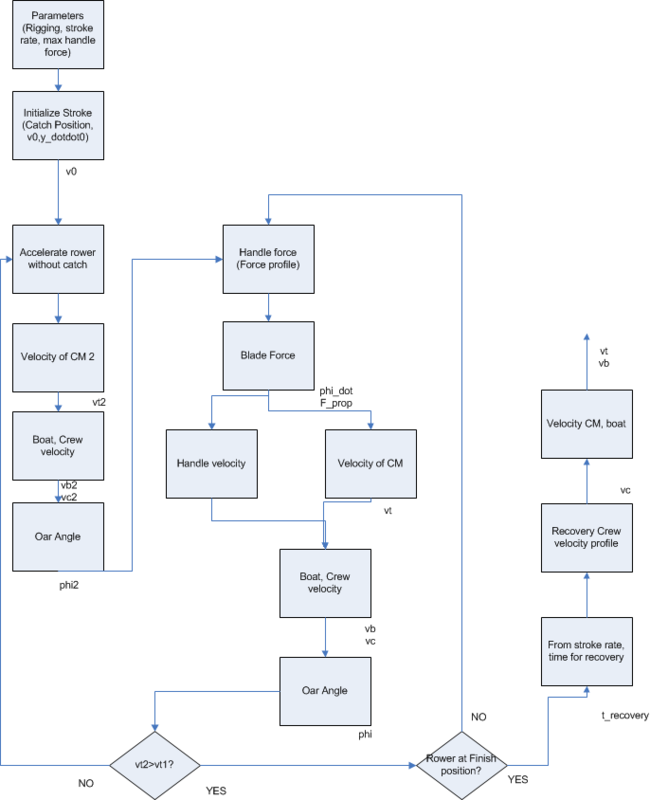 I published a crap-shoot lactate kinetics model on my training blog. This entry was posted in Uncategorized on December 22, 2015 by sanderroosendaal. 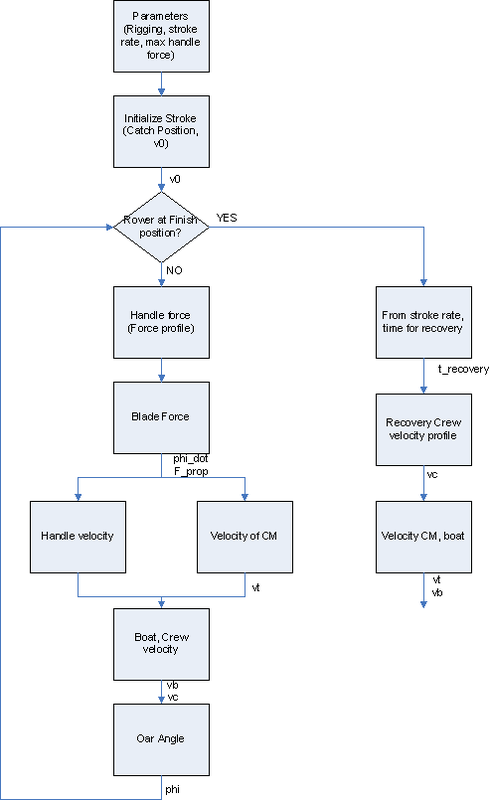 I was triggered to look again at my recovery profile calculations by the discussion on Ben Redman’s blog, with a reference to this article on the Rowing in Motion website. Basically, the thinking is that by optimizing the recovery profile and trying to accelerate on the slide as long as possible during the recovery (by “pulling on the footstretcher”) one can gain speed, as opposed to decelerating early and approaching the catch slower (“pushing on the footstretcher”). 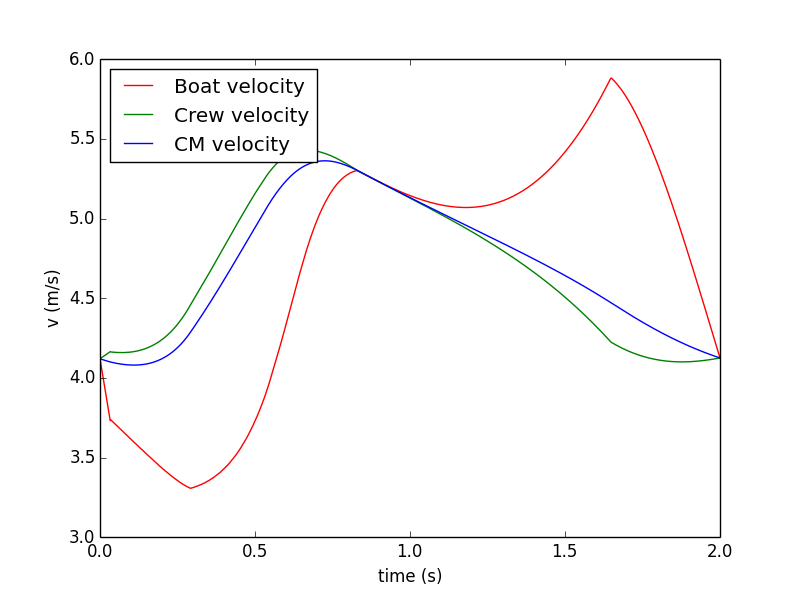 There seems to be some empirical evidence from Kleshnev (RBN 140) that “Olympic champions” have a more pronounced boat deceleration at the catch and a later point in the recovery where the boat acceleration becomes negative. 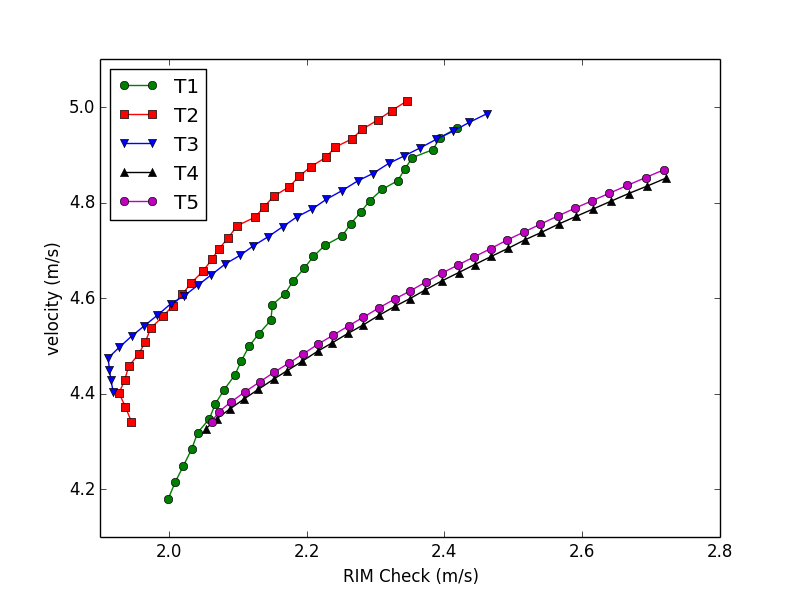 I did some simulations at 30spm using a three different (quite extreme) recovery profiles. 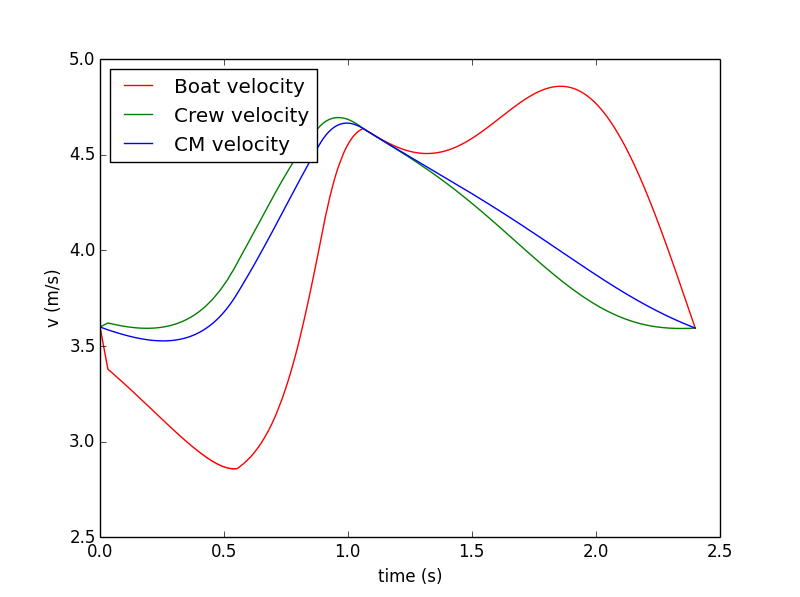 In the following plots the red curve is the (measurable) boat velocity, the green curve is the crew velocity and the blue curve is the velocity of the center of mass. 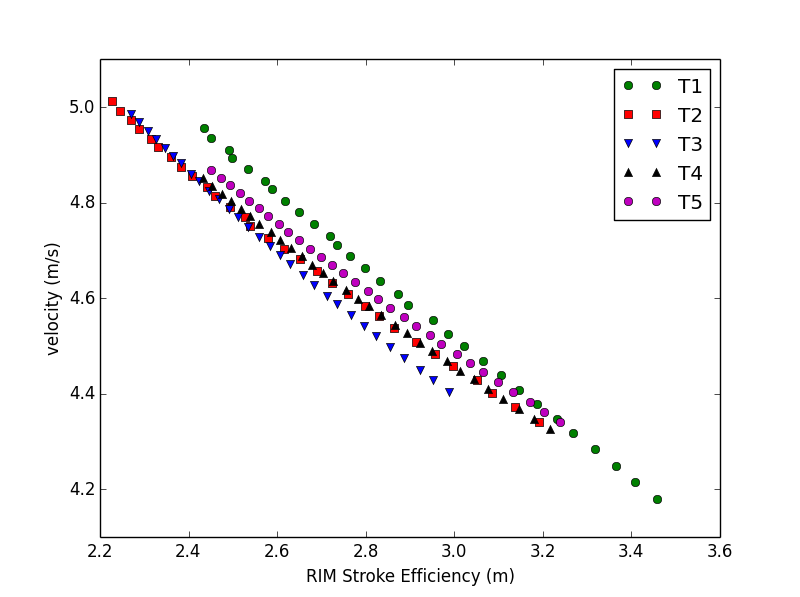 The stroke force profile is the same in all three simulations. 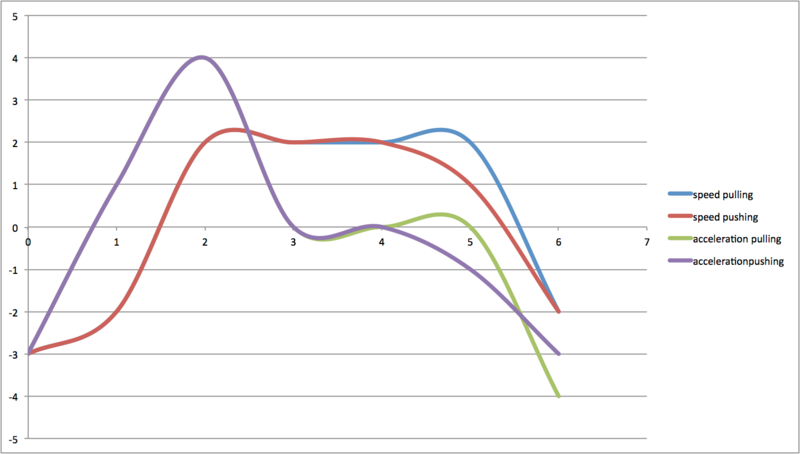 At constant stroke rate and with a similar average speed, there isn’t much variation possible in the recovery style. One simply has to return the handles form the finish position to the catch position in a given amount of time. 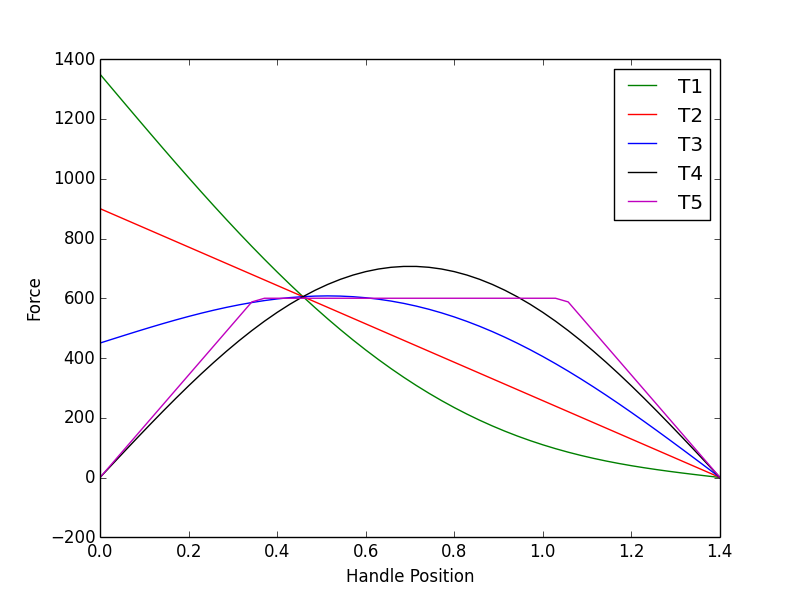 At constant stroke length, the average handle speed will be a given. So either you “pull” a bit more in the beginning and then cruise, or you pull less in the beginning of the recovery and keep pulling. 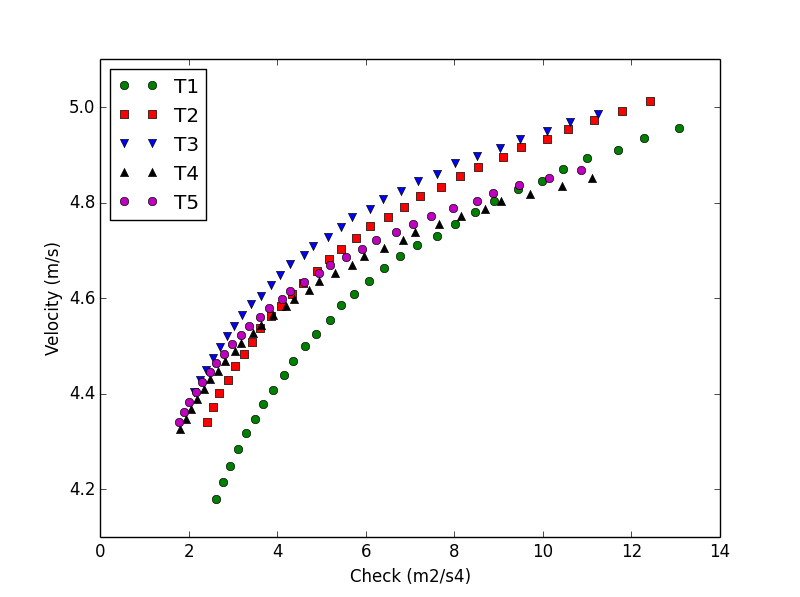 You can see that there is not much difference in the blue curves for the center of mass. 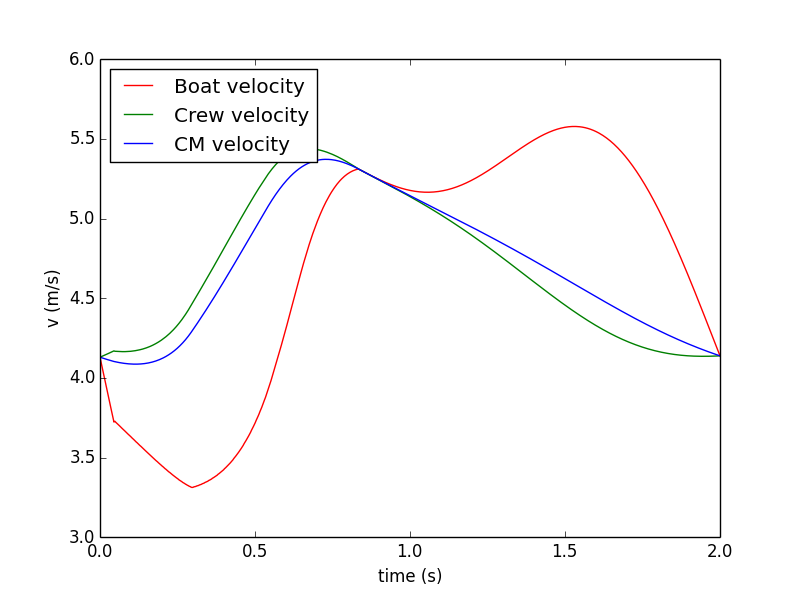 The speed decrease is caused by the drag force on the hull, which is higher at higher boat speed, but as the average recovery speed is a given, the average boat speed is also a given, and even though we are dealing with a non-linear system, the differences are negligible. 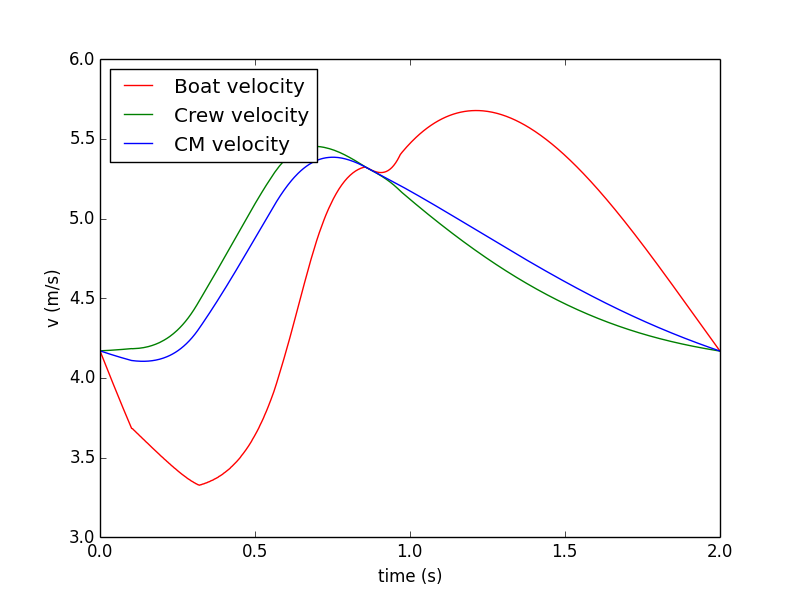 It is very tempting to use hand-waving arguments based on feel in discussions on rowing physics.You have to realize though that a quick illustration as the one above can never be accurate. 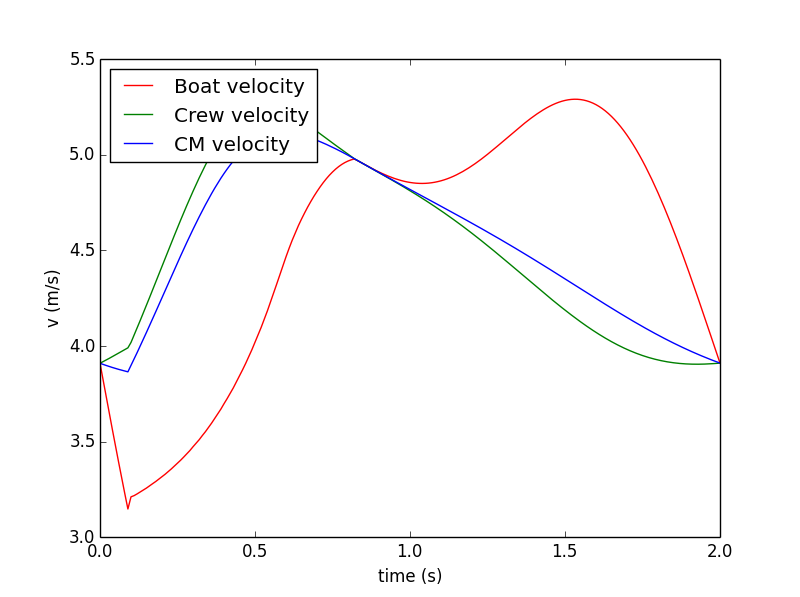 For example, the graph clearly doesn’t show steady state, as the boat speed is 1 m/s higher at the end of the stroke. I am also wondering, if you would calculate a speed profile for the rower that would produce these two curves, if you would arrive at the same stroke length. Are we comparing apples and pears? You have to keep thinking about underlying principles, about whether or not something is significant, and about whether or not there is an alternative explanation for something that is “found” empirically. In RBN 140, Kleshnev discusses some very interesting observations, but I think more studies will be necessary to figure out exactly if (and how) this contributes to the boat speed of Olympic rowers. We may even have cause and effect in the wrong order. Those Olympians also tend to be the ones able to row longer at higher power and stroke rates. There may also be differences in stroke length and posture benefiting boat speed which cause the features described in the Kleshnev paper. This entry was posted in Uncategorized on July 8, 2015 by sanderroosendaal. 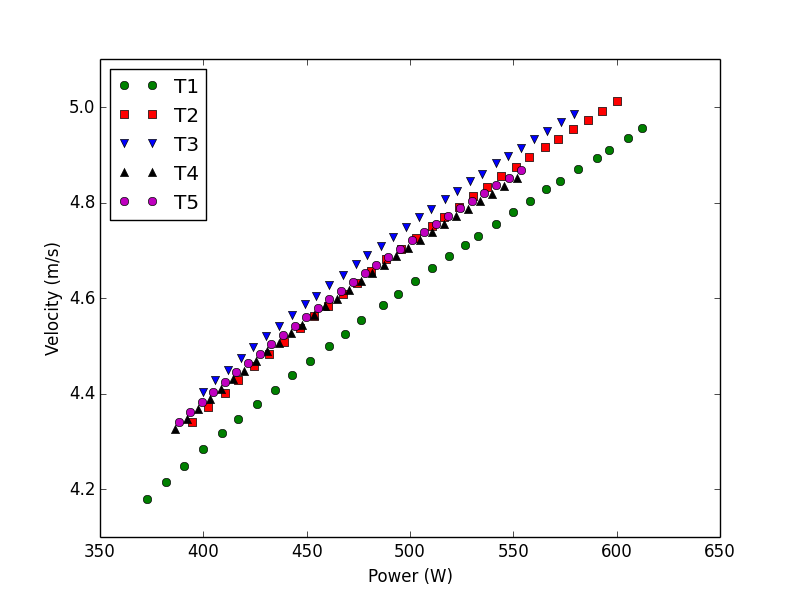 A rowing physics (data) related blog on my regular training blog. This entry was posted in Uncategorized on April 17, 2015 by sanderroosendaal.